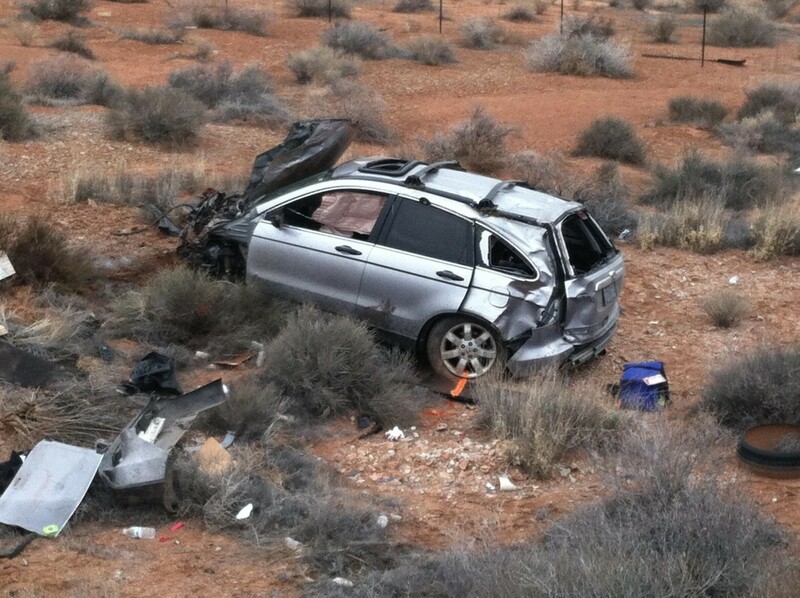 ST. GEORGE – A high speed chase that started this morning just north of Mesquite, Nevada, ended in Utah, with a rollover and the driver being ejected. Arizona Highway Patrol attempted to make a traffic stop of a 2007 Honda CRV at mile marker 2 in Arizona, a few miles north of Mesquite. The driver refused to stop and a chase ensued, with the driver reaching speeds up to 120 mph heading northbound towards Utah. Arizona patrol coordinated with Utah and tire deflation devices were deployed at mile marker 2 in Utah, Sgt. John T. Bottoms of Arizona Department of Public Safety said. “He ran over them, flattening at least one of his tires, and at milepost 3 in Utah he collided with another vehicle,” Bottoms said. “He rolled and was ejected and has already been life flighted, probably in the last five minutes,” i.e. around 8:35 a.m. The injured suspect was flown to University Medical Center in Las Vegas, Nev. and, at 9:30 a.m. Bottoms said he is in the Intensive Care Unit. Bottoms said as far as he knows at this point nobody was injured in the vehicle with which he collided. The car that the suspect collided with was a white four-door Subaru. This is a developing story, details will be added as obtained. UPDATED 9:30 a.m. with hospital destination. CRV’s can go 120 miles an hour…wow! Good job Officers, no one else was hurt by this person and that is good. Not using your seat belt in a high speed chase…Priceless. That was my dad in the Subaru. Fortunately he was wearing his seatbelt and is doing well. Wow you guys got this story up quick. I was very close to this one by a couple of minutes driving near exit 4 on Pioneer road where they ended up off the shoulder. So how would helicopters make this situation less dangerous for everyone??? It would prevent what?? Please help me with this. I have to side with Zeke. Police on the ground were able to stop the speeding car BEFORE he entered the more congested parts of St George.